I was searching for a long time how to enable ad-hoc connections on my HTC chacha and finally I found it!, so I decided to share my experience with you. Virtual Router turns any Windows 7 or Windows 2008 R2 Computer into a Wifi Hot Spot using Windows 7’s Wireless Hosted Network (Virtual Wifi) technology. what is ur platform? ubuntu? It worked perfectly for me and is completely secure with WPA encryption. Thanks a lot! Just FYI, the first time, I had to try twice to get my HTC wildfire S connected. Now, it works directly. are you sure that your pc is already connected to the internet? I can do it when i use ubuntu 12.04, but it is failed to be done in ubuntu 12.10. So I retry it, but there is only isc-dhcp-server instead of dhcp3-server. Now my kindle can search this wifi, but cant connect. can you give me some advice? Thanks very much! It worked for galaxy s (gt-i9003) w kubuntu 12.12. 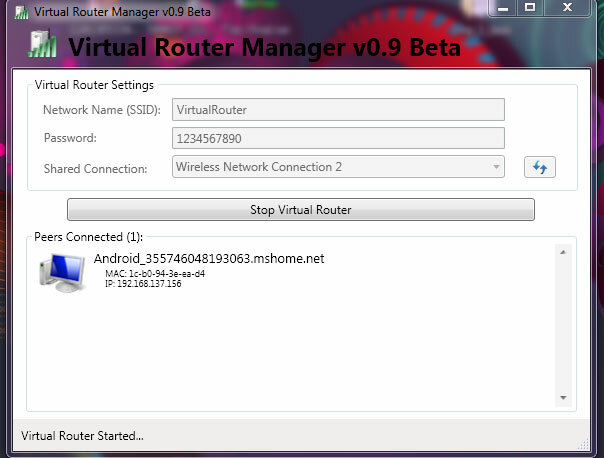 But due to “kernel bugs” I couldn’t set up adhoc wireless + WAP on network_management. I created an unsecured one. Is it unsecured indeed? Thanks a lot for the answer! But maybe I was not clear. My hostap.conf is exactly the one you suggested, with the wap lines. Connecting from my android, for example, it asks for the wap password. It is just the adhoc on kubuntu (I needed to set up to obtain IP) which is not wap (nor wep). My question is whether I am safe or not. Hi, But for me, it says..
hello, i have just installed virtual hotspot 1.2 application to my windows xp and after that my i phone easily connected to it but galaxy note 1 is not even finding the hotspot name in available network list…. do you mean virtual router? I tried this on my ubuntu 12.04 but my galaxy ace watch the connection but it does’t take an ip, must i do something with dhcp? It continuous to show ‘Obtaining IP address’ in my micromax A110. I’m using ubuntu 12.10. Should I add anything to the above steps? Any idea to resolve this..
cant get the Ip on mySamsung s.
for static IP is conection redy. Perfect! Now I can connect my kindle to sync via my ubuntu shared connection. (using Ubuntu 12.04). Thank you! I connected with no internet sharing though, until I did the hack/tweak mentioned in comment #10. Works for me in windows 7 and a sony live walkman with android 4.0, thanks for the tutorial. What you’re doing is NOT enabling ad-hoc wireless on the Android device. You’re running infrastructure wireless mode from the host computer instead of ad-hoc mode. Really thank you very much for your tutorial , i was very happy to see the (GEEKPEEK) at my android device connected to my ubuntu. but unfortunately , there is no internet in my android device. could you please help me to share the internet. oh my! this is working wonderfully. I am successfully sharing my wired connection from Ubuntu 13.04 to my 2 android devices! things are looking good. HI..Thank you for the information. As per u i downloaded virtual router on my windows 7 laptop, however when i tried to start it it showing an error as virtual router could not be started.. Can you please help me on this.. I have the impulse 49 for at&t (u8800-51) and my device fails to connect with my adhoc network. Im sending the signal from a laptop and my phone can see it but wont obtain the IP address. IT’S DRIVING ME MADDD!!! Is there a way I can get this thing to connect?? does this work without a wireless modem??????? i want to access internet in my android tablet but i dont have a wireless modem…. will this solve my problem??????? i downloaded it and installed , but iam not able to fill any of the columns , and its written in the down that “Can not manage virtual router.The service is not running” what should i do , plzz help me???? It works great on windows 7. WOW! It worked for me. Thanks…….. Thanks.. it worked fine with my HTC Desire S & Ubuntu. It works with my Ubuntu notebook and Android phone! where i use hotspot as a username and myhot as a password. thank you sir, you are a life saver…..
so that android device can connect to it, and i think i can’t really call this one as adhoc. and is there another way to connect my android device to adhoc net?